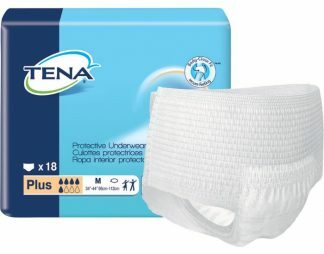 TENA Protective Underwear, Extra Absorbency Designed for heavy bladder leakage protection, TENA Protective Underwear Extra provides dignified protection that is secure and worn like normal underwear. Size Choose an optionSmall 25”-35” (64-89 cm)Medium 34”-44” (86-112 cm)Large 45”-58” (114-147 cm)Extra Large 55”-66” (140-168 cm)2XL 68"-80"
TENA Protective Underwear, Extra Absorbency Designed for heavy bladder leakage protection, TENA Protective Underwear Extra provides dignified protection that is secure and worn like normal underwear. The exceptional security is due to the InstaDri Skin-Caring System technology, which rapidly absorbs urine into the core and away from the skin, so that even when seated or lying down for long periods of time, the wearer will stay dry and comfortable while the risk of skin irritation is reduced. 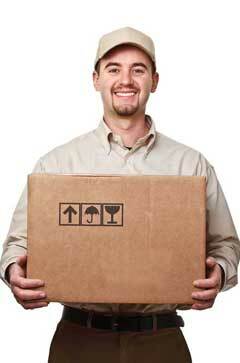 The Body-Close Fit design moves with the body for more comfort and greater wearer dignity. PATENTED BODY-CLOSE FIT TECHNOLOGY uses more elastic threads than previous TENA Protective Underwear throughout the pant for greater discretion and worry free security. INSTADRI SKIN-CARING SYSTEM improves surface dryness, promoting healthier skin. UPGRADE: Body-Close Fit design moves with the body for more comfort and greater wearer dignity. Small 25”-35” (64-89 cm), Medium 34”-44” (86-112 cm), Large 45”-58” (114-147 cm), Extra Large 55”-66” (140-168 cm), 2XL 68"-80"
Tena Protective Underwear are the best on the market! The comfort and fit is superior! Best of all is the customer service at Careway Club. I love that my order arrives within days! This TENA product is the best on the market. The descriptions are accurate and reflect the actual product. This protective underwear is far superior any depends product marketed today. Walgreens incontinence products are reasonably priced and better quality than the Depends brand but do not hold a candle to the TENA line. I highly recommend this product. 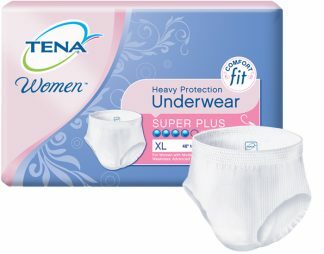 I believe that the Tena briefs are wonderful! They are the most comfortable that I’ve tried, and I’ve tried several different brands!